33 years since ‘Living in Oz’?! My bedroom door in 1983. Hearing that today marks 33 years since “Living in Oz” was released made me feel really nostalgic. Thirty-three years?! That’s how old Rick Springfield was in 1983 when the album came out (the month before his 34th birthday). And when I say album, I mean an actual record album. And do you notice the cassette tape cover on the promotion poster? And if he was 33 that year, that means I was 13. Thirteen!!! How can that be 33 years ago?! It’s still one of my favorite RS albums and “Souls” is one of my all-time favorite RS songs. On the upside, who would have guessed that 33 years (33 YEARS!!!) after I taped this poster on my 13-year-old self’s bedroom door that I would be writing this blog post – nevermind the fact that none of us had ever heard of a blog at that time – 10 days after I saw that guy on the poster perform “Affair of the Heart” and “Human Touch” live during his summer bus tour (along with new music)? 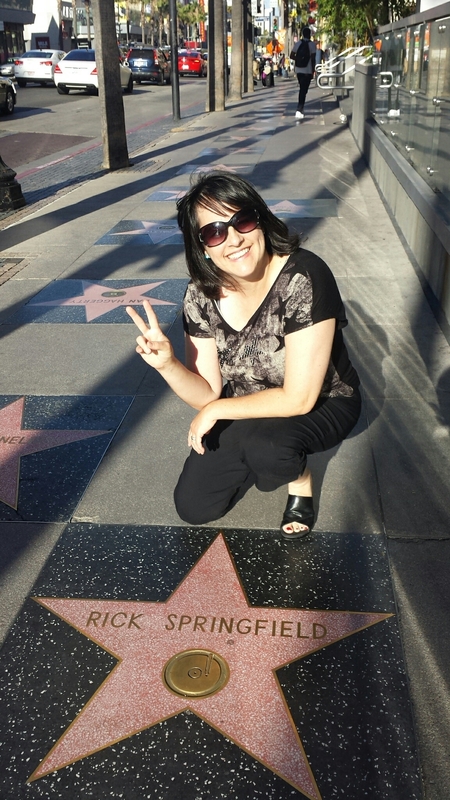 Two years, two months and six days ago, Rick Springfield finally got his star on the Hollywood Walk of Fame and I finally got to see it today. Fortunately it is a little off the beaten path – in front of the Live Nation building instead of Groman’s Chinese Theatre or the Hard Rock Cafe, where there were more crowds and less room to take photos (and more stains on the sidewalk). RS and team are off on their summer tour and I was fortunate to see one of their first shows on the tour – at Comerica Theatre in Phoenix this past weekend. I had plans with my family for earlier in the evening so when my friend and I got inside, The Romantics were finishing their last song. Part of the delay had to do with all the roads closed off downtown for a civil rights protest and the parking garage being on the other side of the closed roads. At one point, the protesters were facing us as we turned down one street. Fortunately the demonstration was still peaceful at that time. I hadn’t told my friend – who I went to a RS concert with last year, as well as a few times in high school and during the Karma tour – where our tickets were so it was fun to surprise her as we got directed to the second row. It was also fun to meet a fellow fan that I had chatted with on Facebook before – coincidentally our seats were right next to each other. It was a great show with a wonderful view – toward the end we made our way to an empty spot directly in front of the stage – and I even got two seconds of the human touch, a quick tap on my fingers as he walked by. I forgot to reset the settings on my phone for concert conditions and most of my photos and videos are blurry so I won’t bother posting them here. Afterward, my friend and I hung out outside for awhile catching up. We’ve known each other more than 30 years and although our schedules don’t allow us to get together much, we always have a great time together. It was very quiet outside the theater with no sign of the earlier protests, but with a quick check on our phones, we saw that about a mile or so away, the demonstration was no longer peaceful. Police were in riot gear and there were reports of tear gas being used on the demonstrators who were trying to close down the freeway. It was sad to hear that as we were enjoying our concert inside, anger and hatred was manifesting into violence not too far away. I had hoped that it would remain a peaceful demonstration and am grateful to those officers who prevented it from getting any worse. In fact, with all the anger and hate manifesting in violence all around the world these days, music is such a refuge from it all, as are movies, TV shows and other forms of entertainment. I’m grateful to all of those performers who add love and laughter to the world or else it would be too overwhelming. That being said, I sometimes feel a bit shallow spending so much time writing a fan blog, when there are so many other things going on in the world, but I guess this is my little refuge for now. Anyway, back to the evening of the show. Despite believing I can just leave one of his concerts without at least trying to run into RS afterward, I failed again. My friend and I ended up hanging out awhile and once he came out, I – along with about 20 or so other people – approached him and I was able to get a quick selfie with him. There was no time to say anything besides, “Can I have a picture?” and I ended up feeling a little guilty because it was late and he probably just wanted to get inside his bus, have a glass of red wine and go to sleep. Fortunately he seems to recognize that his fans may not be able to express their feelings and appreciation for him when they’re standing right in front of him and he’s still gracious to them. Wishing RS and his band and crew a wonderful – and safe – tour!